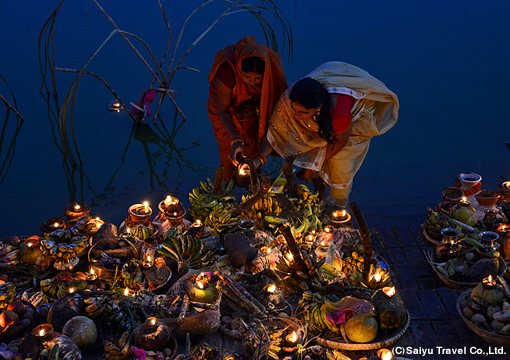 Witness the most photogenic festival in Nepal, CHHATH PARVA – Prayer to the SUN｜Saiyu Nepal Trekking & Expedition Pvt.Ltd. In the morning, go to Kathmandu Airport Domestic Terminal and Check-in by yourself. *Domestic flight ticket will be e-mailed to you. Print it out and show at the Airport. Upon arrival at Janakpur Airport, meet up with Local Guide and transfer to Hotel & check –in. Afternoon, explore and photograph village, people in the outskirts of Janakpur. Also we will visit Hindu Temples in Janakpur upon your request. Morning, explore villages in rural area. 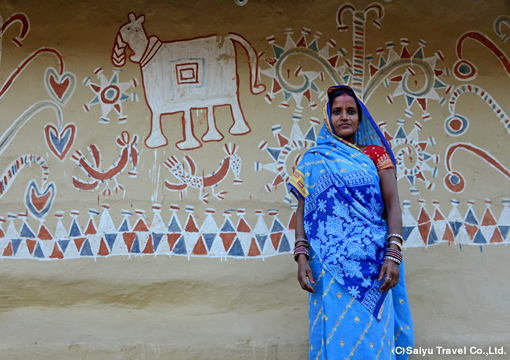 People still practice their traditional drawing animal and Hindu deity on the wall of their house, called Mithila Art. You will photograph real local life of this region. Lunch and rest at Hotel. 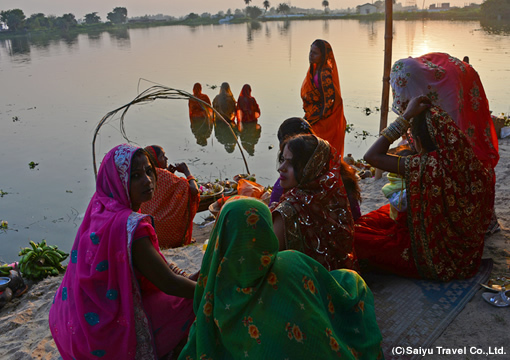 Afternoon, we visit the pond where local ladies are preparing offering for festival. By sunset time, you will witness one of the most beautiful moment in Nepal - Ladies pray to the SUN. Very early morning, visit Ganga Sagar, the most holly pond where is the center of pray of Chatt Parwa. You will witness hundreds of ladies praying in the pond and waiting for the Dawn pray. This is the highlight of this Festival. Return to the hotel and have breakfast. Transfer to Janakpur Airport. * If you like to continue from Janakpur to other cities such as Chitwan, we will discount your one way ticket fee. Please inquire us. Domestic Airfare (Return ticket for Kathmandu –Janakpur) / Local English Speaking Guide/ Accommodation and service charges mentioned in the itinerary / Meals (BF 2, LN 2, DN 2) / Entrance & Transportation for visit / Other taxes, etc. Transport arrangement from your hotel/guest house to Katmandu Airport is USD10 extra for Sedan type Car and US$16 for Van.In case your hotel/guest house is located outside of Kathmandu city, extra charge will be applicable. ＊During the main festival, there will be restriction of car in the city. In that case, we have to walk to the festival sight. ＊Please bring torch/headlight. We will explore after sunset and before sunrise. ＊Janakpur area is not visited by foreign tourist and not developed as tourist spot. Please understand the condition of Local service. ※Above mentioned prices are for one person. 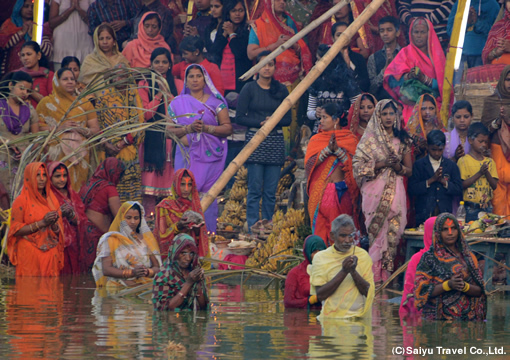 Chhath parva is celebrated by Local people of Mithila region both in Nepal and India .the festival is dedicated to Sun God. 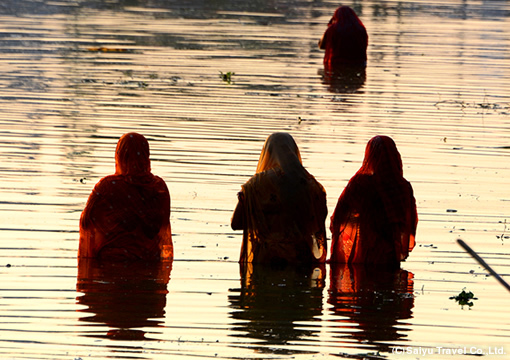 The word “Chhath” represent Sun God and Parva means festival. 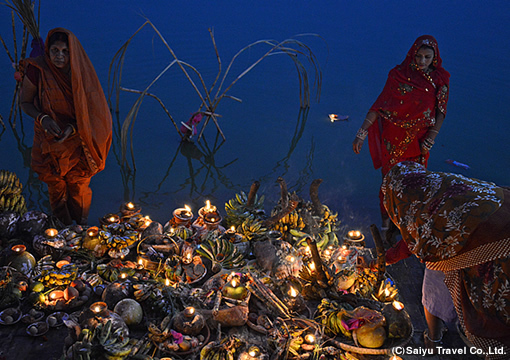 People gather around the pond and make offerings, perform prayer in sunset and sunrise time. Local ladies prepare offering and bathe in the pond. They give prayer towards Sun God, with their wish of happy life for family, children and thanks for the Sun God. This sight is one of the most beautiful, photogenic moment among the festivals in Asia. 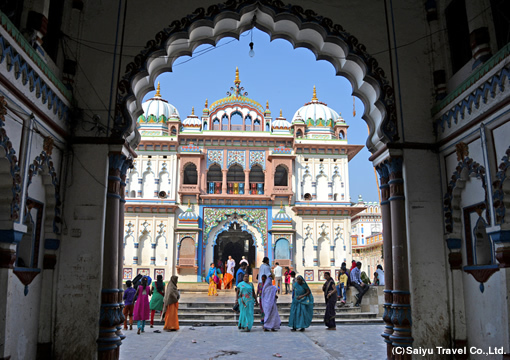 Janakpur, where the CHHATH PARVA festival is held, is known as a sacred place for Hindus. It is also known where Ramayana was located, the first of two ancient Indian heroic epic poem written in sanskrit. Deeply religious Hindus engage in grazing and agriculture. 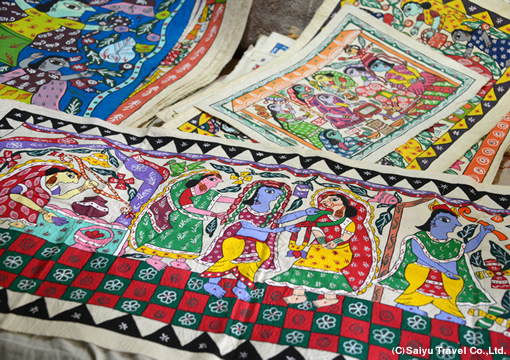 Janakpur is called Mithila area such as Bihar district in India, and local ladies draw Mithila paintings.